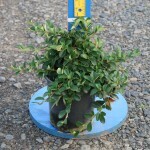 A fast growing groundcover with rich, green foliage. The white flowers in spring are followed by red berries. It is a dense grower and sometimes semi-evergreen. Drought tolerant once established, but provide moisture for a good berry display. Useful in mass planting, in a rock garden, or cascading down an embankment.